Nerf Super Soaker Soakzooka | Nerd Much? With Memorial Day behind us, summer has unofficially begun. What better way to kick off the season than gathering your loved ones for an epic Nerf Super Soaker battle? With the weather really starting to heat up, it doesn’t really matter where you live, everyone can get down with an awesome water battle royale with Nerf Super Soakers. Well as the weather has changed, so has Nerf, and they are constantly releasing the newest in water blaster tech. Like those Super Soakers of our childhood, the latest greatest in the Nerf Super Soaker arsenal is sure to get you excited for summer. 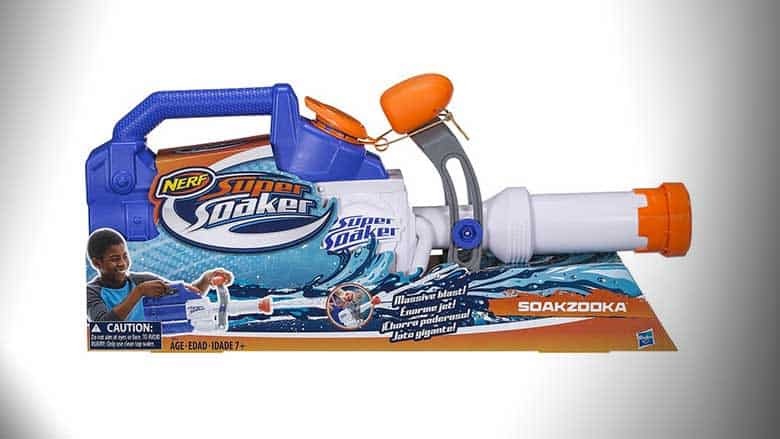 Next in the Super Soaker lineup from Hasbro, the Nerf Super Soaker Soakzooka is a gigantic single stream blaster that packs a mighty punch. With a tank that holds a hefty 55 ounces (almost a 2 liter bottle of soda) this Super Soaker shoots a massive stream of water. Get ready to drench your opponents with the Soakzooka. Although not the same model you may remember from the old days (don’t worry you can still get the original), this Soakzooka is actually easier to reload and fire than previous generations and is modeled to pack more of a whallup with less effort. Simply move the orange handle back and forth to shoot a powerful blast of water as you navigate through your chosen “battleground” (or backyard.) The wide mouth reservoir tank makes refilling easy, to keep you in the fight, and not at the hose or faucet. This is a behemoth of a water blaster with a pretty sizable ammo tank so it isn’t too surprising that it is recommended for ages 7 and up only. This new NERF Super Soaker Soakzooka is currently priced at $19.99 and is available now on Amazon. Choose prime shipping and get ready for your next epic super soaker battle.